I’ve spent so much time living overseas that I now feel out of place in my home country. 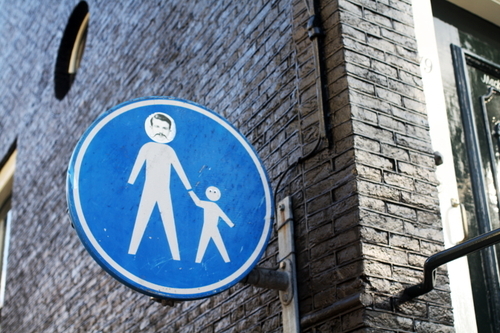 Humor helped me get through the days in a small Hungarian town, and it’s still doing the trick in California. Scroll down for my stories. The bridges over the Danube are one of the most amazing parts of Budapest. And they get even better when they close to have a party! Budapest used to be a place that depended on ferry boats, but times have changed. For a limited time, however, the opportunity was back! Instead of watching Indiana Jones, go live the adventure! All you have to do is take a ride on this train. Wine tasting is usually a fun relaxing at activity. In this case, it was a lot more exciting than expected. A royal title comes with all kinds of obligations and responsibilities, but have you ever thought how hard it must be to choose the location of your castle? What Day Does Your Country Vote? A Sunday vote in Hungary has led me to question what day we should head to the polls to decide important issues. There's an annual event that brightens even the darkest winter nights in Amsterdam, but it does come with some frustrations. Do you have any special foods you eat to bring luck for a new year? We do, but we ran into a bit of a problem with an eat vs. avoid situation. New Year's Eve in Amsterdam is dangerous, but is it a good time to visit? Well, the oliebollen alone make it worth it. Sinterklaas, or the Dutch Santa Claus, takes letters with children to a whole new level. Hint: they're delicious! Years of living abroad has made me forget the purpose of Thanksgiving, so I asked around to my foreign friends to see if they really know what they holiday is about. Sinterklaas, the Dutch version of Santa Claus arrived to Amsterdam this morning. Of course, he did it in the most Dutch way possible. There's a place in Amsterdam where everyone can take a selfie with the King and Queen of the Netherlands, and you know you want to do that. A letter to the King of the Netherlands thanking him for the King's Day celebrations in Amsterdam. When I moved to Hungary in 2010, I planned to stay for a year. The theory was that I would hate teaching English and head home, or I would like it enough wander off and continue with adventures in different foreign lands. But, I threw the plan in the trash, and Hungary was my adopted home for four years. After years of teaching and being a student, I packed my bags in late 2014, and started moving on. 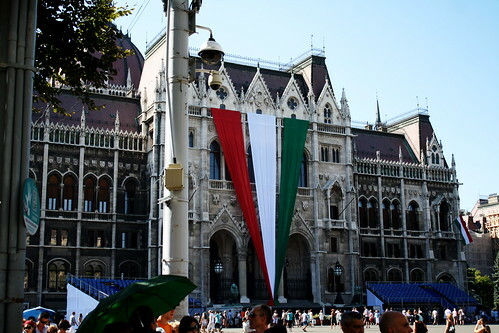 I noticed that expats who move to Hungary often stay either one year or multiple decades, but I still think four years was the right amount of time for me. But, I haven’t escaped Hungary. Not by a long shot. Following another common trend, I wasn’t able to avoid falling hopelessly in love with a beautiful Hungarian girl. She was convincing enough to get me to tag along to Amsterdam, and my wanderlust was beginning to find its cure again. Unfortunately, loving someone with a different passport has some downsides, and I’ve had to head back to my native country while I continue to try to figure out a way for the two of us to live in the same country. 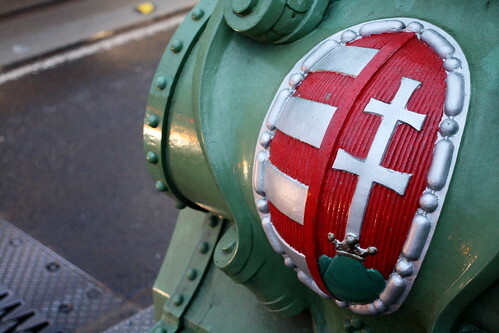 So, my website is not dead, but it will no longer be primarily about Hungary. However, I haven’t yet shared all my past experiences, and I’m sure to have many future visits to Hungary where I can happily indulge on the delicious food that I already miss. This is pronounced “Vee-sont-laa-tash-rah,” and it means goodbye. In this case, it’s a little harsh and inappropriate, but I don’t have the skills to say “until we meet again” to the land of the Magyars. 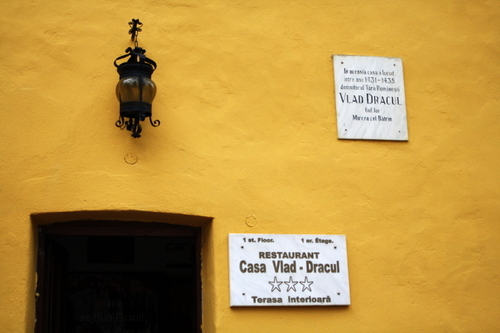 I guess visiting the birthplace of "Dracula" in Transylvania makes up for missing a few Halloween parties!Living abroad requires sacrifices - there’s no doubt about it. Some are easier, and others are more difficult. But, there’s one particular day that bothers me: Halloween. Let’s face it, Europe was designed to be a perfect setting for the holiday. Most of our classic horror stories originated here, and the spooky feeling is based off of old, strange buildings. Add some changing leaves, gloomy weather, and shorter hours of sunlight, and the recipe is complete. That’s why it’s more difficult to ignore this one. Thanksgiving doesn’t bother me so much because I often forget it even happened. Most of the other holidays are either celebrated or boring (and therefore irrelevant to me). Of course there are parties or other events if you look hard enough, but it’s not the same as having costumes, pumpkins, and candy shoved down your throat despite any and all protests. One promising fact is that I’ve been seeing more and more shops with Halloween window displays blocking their normal products. On the other hand, a lot of Christmas decorations are getting put up, so that kind of destroys the scary vibe I was hoping for. The good news is that I don’t have to figure out a costume and stock up on candy. And, I could be somewhere much worse, so I think I’ll wander the canals of Amsterdam tonight and look for and ghouls, goblins, or other monsters that may be about. 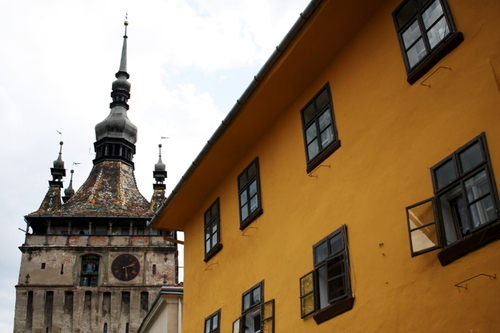 Try and tell me the town of Sighișoara doesn't have a slightly spooky image. I’m still struggling with pronunciations, but this is probably the word for “pumpkin.” They do sell these in the grocery stores, but I’m not sure I they’re to make jack-o’-lanterns or pies. I’m going to stop complaining and take what I can get. 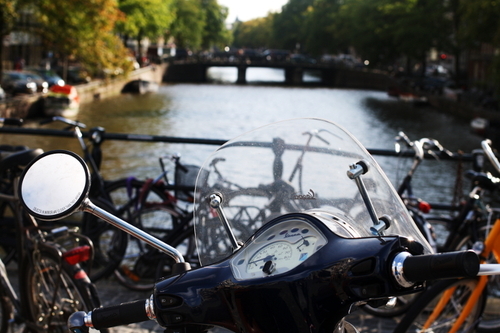 Amsterdam, and the Dutch in general, are famous for their bikes. The two wheeled monsters are everywhere. 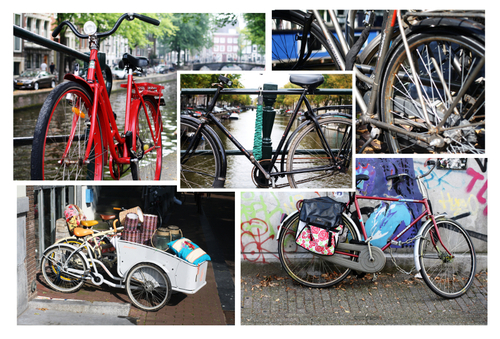 You know those iconic pictures of bikes locked to every railing and canal bridge? 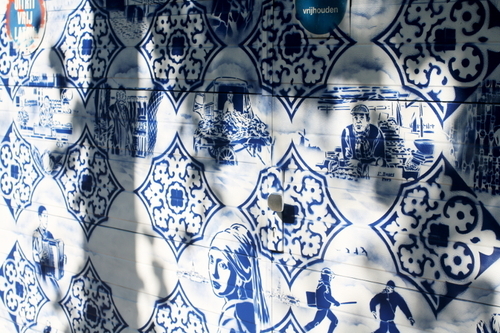 Those aren’t exciting – they’re just Amsterdam. 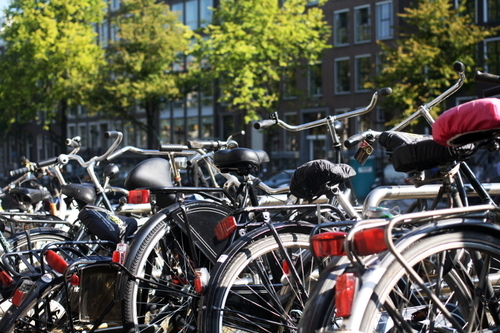 Bicycles are the pigeons of Holland. 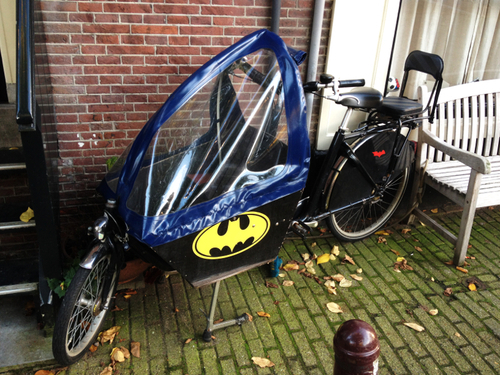 Anyway, I was pleasantly surprised to learn that Batman lives in Amsterdam. As evidenced by the following photograph, he forgot to lock the Batbike in the Batcave, but it does appear that there are one or two Baby Bats riding along with him. Or, is Robin smaller than we all thought? I’m still struggling with this whole Dutch language learning task, but I’m fairly certain that this word means “Bat,” and that it’s pronounced somewhere along the lines of “F-leer-mouse.” Dutch speakers and/or billionaire superheroes are encouraged to make corrections. 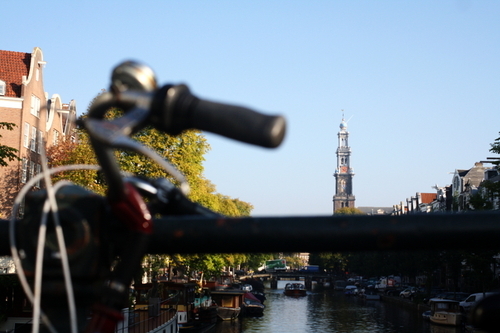 It would be tough to say what Amsterdam is most famous for, but I’m sure bicycles make it into the top ten. Creating a strong cycling infrastructure is something that’s admired around the developed world as a civilized, responsible, and environmentally friendly way to transport citizens from Point A to Point B. However, it’s my opinion that the developed world needs to rethink its value system because a city full of bikes is TERRIFYING. Before you start to think that I’m being sponsored by an oil company, let me explain it in an easy way for you to understand. Have you ever played the classic game Frogger? If you haven’t, I would advise that you don’t admit it to your friends, but you continue reading so you can at least join the conversation about this later. It’s a game about poor little frogs who seem to desire incredibly dangerous daily commutes. They’re forced strategically maneuver through cars, floating logs, and other types of deadly items, and their timing is absolutely critical. Amsterdam is the game, and I am the frog. Pedestrians, bikes, motorcycles, cars, trucks, and trams all share the same streets. I can’t prove it, but I’m pretty sure that the boats sometimes use the road, too. All of this wouldn’t be so alarming, but since the street is usually crammed between a canal and an ancient building, it’s usually about wide enough for a narrow car or 1.5 cyclists. 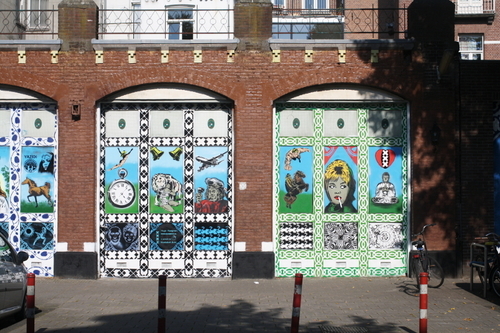 Fortunately, Amsterdam is a civilized city, so there are rules to keep everyone safe and in order. Unfortunately, no one seems to care about the rules. I can hear the arguments now. “Alex, you just arrived in Amsterdam, so you don’t know how it works. It’s very organized – you’re just ignorant.” That may be true… But, I must remind you that central Amsterdam seems to be about 60% tourists who also don’t know the rules, and many of them have recently consumed one of the city’s other famous products which has caused their brain to be temporarily incapable of though (if it ever was before). Anyway, the more time I spend here, the better I get. We’ve started thinking of it as different levels of the video game, because we move to more challenging situations as we become numb to the fear. I’ve yet to ride a bike down a busy street while using both my hands to apply makeup to my face (yes, I saw that last week – and she was doing a pretty good job), but I’m on track (for the bike skills, not the makeup thing). It will just take time, practice, and dedication. But, do you want to know the most impressive part of the whole situation? I’ve yet to see a dead frog on the street. They seem to be better at this than my little friend in the video game. Some creative person made this sign a litlte more lifelike. In a not very impressive way, I’m using a dictionary to find this word that is supposed to mean “bike.” Therefore, I don’t know if it’s correct, and I’m not even sure how to pronounce it. If you speak Dutch, any help would be appreciated. This is an interesting mix of characters! After a summer busy with writing an MBA thesis, and the other stress that follows finishing grad school, I find myself in Amsterdam. So, you should prepare for some interesting stories and lots of pictures. 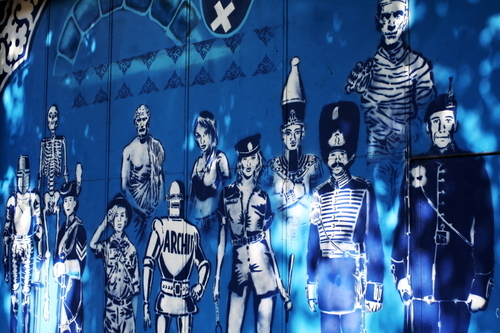 The ironic part is that even though I’m in one of the more photogenic cities in the world, I’m attracted to pictures of graffiti type art on walls. 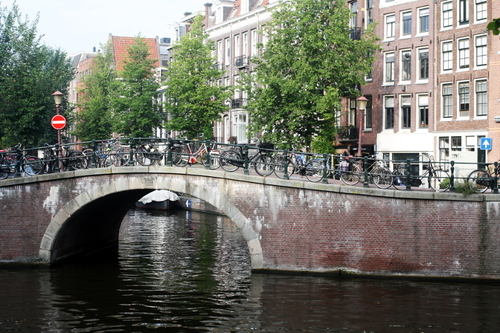 Yeah, the canals are super beautiful, but my pictures just look like everyone else’s (and the cover of every Amsterdam guidebook ever written). So, let me get some grungy stuff out of the way, and I’ll share more words soon. I'm not an art historian, but I'm starting to see some familiar faces. 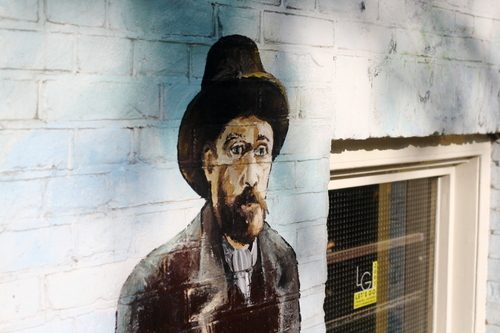 Van Gogh took a selfie and someone painted it on a wall. 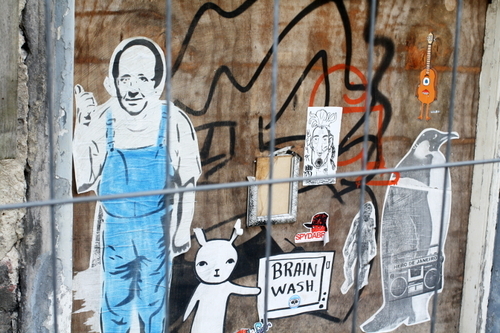 Be careful about being brainwashed! 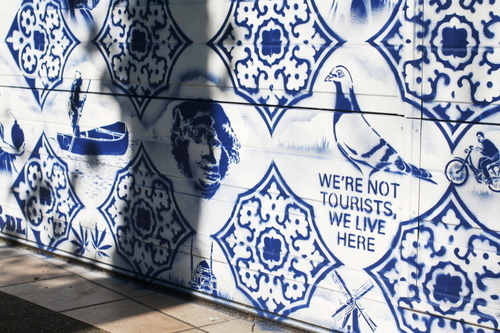 Don't forget: Some people HATE being viewed as a tourist. Try not to insult them.